After a long storm-filled Fall, Boston's beautiful weather is finally back; indicating the return of the city's most prized music festival. That's right, it's Boston Calling season again, and the festival's team is as ready as ever to re-energize the music community. While the past year's lineup looked to be an unstoppable force, this year's music talent brought a more indie and lowkey aspect that we couldn't help but smile looking through. In fact, we saw a few acts that we thought needed a special shout-out on the WIRE blog. So without further adieu, here are our picks for the five acts we simply cannot wait to see electrify the Harvard Athletic Complex. The self-proclaimed "best boy band since One Direction" brought waves throughout 2017, consistently releasing albums under their recognizable trilogy title; Saturation. Hailing from San Marcos, Texas, this internet-based music group originated with members who were friends in high school. The rest eventually connected after having replied to a thread on a Kanye West fan forum. 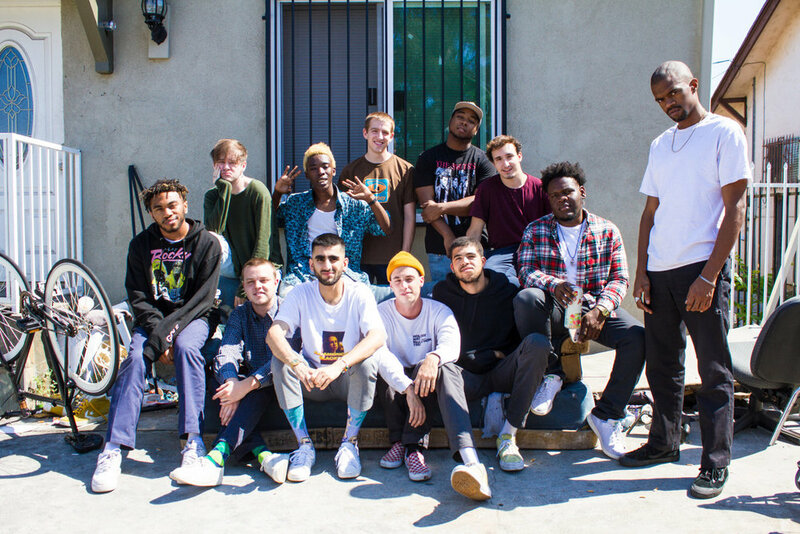 While a group this big seems to be bound for dysfunctionality, Kevin Abstract, pictured sitting on the left, almost acts as a key centerpiece to their success. He's often found on a majority of the tracks to any given Brockhampton project, providing a stellar signature vocal performance. Despite this undeniable key player, the rest of the members, 14 to be exact, also have their highlights. The track "Gold" may as well be attributed to Dom McLennon's verse, as his clean boom-bap sounding rhyme scheme truly takes the cake on this single. There's no telling what this new-age phenomenon could have in store for us, so you'll just have to be there on the 26th. In 2016 we got The Vaccines, 2017 brought Converge, now, Boston Calling brings us one of England's most commendable rock super duos, the almighty Royal Blood. Their self-titled album launched them to the forefront of the scene, being picked up by festivals all around the United States; including an iconic performance at Governors Ball. The two particularly stand out for how much they achieve as a band, where Mike Kerr, pictured on the right, provides the quintessential vocals and killer bass guitar rifts. Whereas Ben Thatcher, pictured on the left, plays the drums with the skill of a seasoned veteran, yet with the might of a vintage classic rock member. These two are sure to bring a heavier aspect to the rock genre that draws so many concertgoers to this event. With this band's unstoppable presence in the festival circuit, it was only a matter of time until they dropped by Boston Calling. This jazzed up jam band came to notoriety through touring with Umphrey's McGee, serving as an opening act that's talent was soon discovered nationwide. Tauk's work ethic as a band is commendable, as their discography spans countless projects over the past six years. Their most recent project is titled Shapeshift I: Construct, and features some of their most futuristic-sounding work to date. In particular, A.C. Carter, the band's organist and keyboard player, adds a unique holistic flavor to tie the record together. Matt Jalbert and Charlie Dolan tear it up on their respective guitars, while Isaac Teel rains hell with groovy drumlines. If there's something to be taken away from this group, it's that they're unique and complimenting styles makes Tauk a matchmade in heaven. While they may have an earlier slot in the day, they're an act that's bound for a lively start to the Saturday afternoon. If you've ever listened to the likes of Erykah Badu, Flying Lotus, or Suicidal Tendencies, then this bass guitarist may sound a little familiar. Meet Thundercat, an LA-based musician whose bass guitar work is treasured worldwide, and is rarely confined by a genre. With the recent release of an album, which had every reason to be titled Drunk, he seemed to be a clear scoop to be added onto this year's performing lineup. The album is a mess in the best way possible, you'll get a taste of a psychedelic world with oscillating vocals, jazz-influenced or down-tempo drums, and his masterful bass work all throughout. The lyrics are a bit out there, but they certainly add to this liquor-induced high feeling that characterizes the record. While his music may not be for everyone, connoisseurs of more experimental and jazzier music are bound to get their fix from this goofy and lovable giant. Excitement grows in the city as we prepare for the storm of this goblin-gone-flower boy. While his earlier work simply seemed like fun controversial potty-mouthed blabbering, it posed the question, especially as seen in this Earl Sweatshirt interview, what direction would this creative head in? Well, the latest album from Tyler the Creator, titled Flower Boy, could not have been a clearer response. The exaggerated angst turned into something quite beautiful, almost like the album title indicates the blossoming of a flower. Simply put, many fans since the Odd Future days have witnessed Tyler's maturity as a spectacle to see. Whether it be on more aggressively fulfilling tracks like "Who Dat Boy", or on smoothly rolling melodies like "Glitter", there's just a newly profound sense of artistry present. The Flower Boy live show, which generated a lot of buzz from Coachella, is something that no one should have to beat themselves up over missing. Witness this icon take the stage on Saturday and undeniably make Boston music history! Although we only highlighted five artists, there are so many more to be excited over-- many of which being a little more on the popular side. This just goes to show how Boston Calling makes an effort to not only bring in huge talents, but give the underground a stage to shine on too. You'll experience a diverse lineup, ranging from the lyrical hip-hop of the likes of Eminem, to more classic rock like The Killers. Along with that, fantastic food from local vendors that we'll be sure to keep spotlighting like we have the past few years! The Boston Calling music festival will be taking place on the Harvard Athletic Complex, this upcoming May 25th through 27th. Tickets, including single days, could be purchased by clicking here. We hope to see you out there!